Let All Men Know That This Is Holy Ground: Melbourne’s Shrine of Remembrance. | The mind is an unexplored country. Let All Men Know That This Is Holy Ground: Melbourne’s Shrine of Remembrance. Today, April 25 2015, marks the centenary of the landings on the beach at Gallipoli of the Australian and New Zealand Army Corps. ANZAC Day is a focal point in the Australian calendar. It has become the day on which we mark our respect for all who serve in uniform, and the day we honour our war dead. The rights and wrongs of the Gallipoli campaign have been argued for a hundred years already. They will be argued for another hundred years and beyond. I myself would be happier if the defeat at Gallipoli was balanced with celebration of our victory at Milne Bay. But I’ve made that point already, elsewhere. Today I will let pictures do most of the talking. Melbourne served as the seat of the federal government from 1901 to 1927. When the First World War ended in 1918 it was therefore the logical place to build a grand war memorial. The poster above dates from 1936. 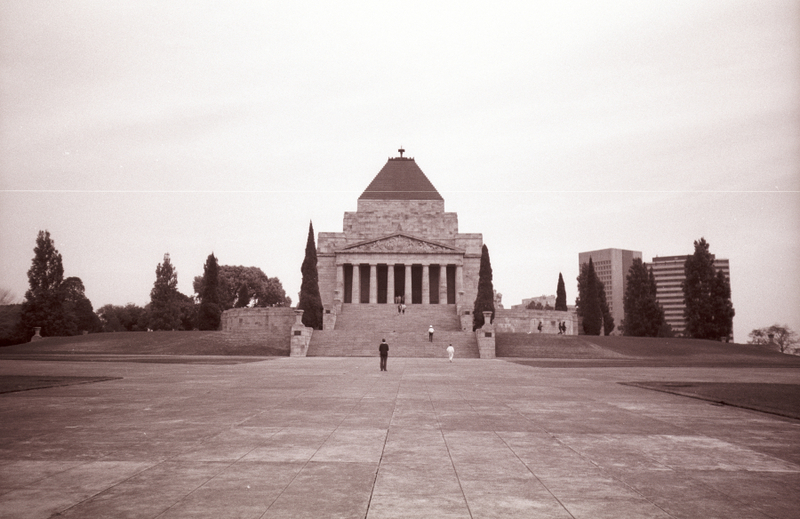 The Shrine of Remembrance, in the top right corner, was completed only two years earlier. Well before that it had become a significant landmark. The final design adhered to this early sketch in most aspects. The broader surrounding marked by the statues of horsemen was abandoned, and the vast paved area is instead mostly parkland. On the day of its dedication in 1934 the Shrine attracted a crowd estimated at 300,000. This was about one-third of Melbourne’s population at the time. During the dedication it was decreed that the Shrine would always be visible from the city and that no building along St Kilda Road would be permitted that would interrupt that view. So far, in spite of Melbourne’s growth as a world city, that decree has held. There have been some changes to the Shrine itself, and numerous additions. Surrounding parklands feature many smaller memorials. A development of recent years is mostly hidden beneath the main structure: the Shrine stands on an artificial hill, resting on pillars with the earth built up around it. This created an undercroft which now houses a visitor centre. Accessible through the new wings that flank the main structure, the centre provides a gentler means of entry for old warriors. The photo of the dedication ceremony includes a feature now lost: the reflecting pool before the north face, in the avenue leading down toward the city. This was removed to make way for the World War Two Forecourt. The World War Two Memorial is a touch of modernism in a precinct that is dominated by classical style. Six solid warriors – two sailors, two soldiers, two airmen – bear the coffin of a slain brother. The coffin is draped with the Australian flag (the Federation Star is visible just above the soldier). Although rated as one of Melbourne’s prime tourist attractions the Shrine retains a quiet distance, and a dignity. The long walk up the avenue to the north entrance can be a sobering experience. The noise of the trams clanging their way through the city traffic grows subdued. This place has been touched by the spirits of those who died in faraway places; the earth moistened by the tears of those who mourned them. However bright and sunny the day, a visitor is compelled to thoughtfulness. The east and west external walls are adorned with four carvings that represent Peace, Justice, Patriotism and Sacrifice. LET ALL MEN KNOW THAT THIS IS HOLY GROUND. THIS SHRINE, ESTABLISHED IN THE HEARTS OF MEN AS ON THE SOLID EARTH, COMMEMORATES A PEOPLE’S FORTITUDE AND SACRIFICE. YE THEREFORE THAT COME AFTER, GIVE REMEMBRANCE. Inside, an ambulatory runs around the Sanctuary. Books of Remembrance lie open, inviting the hopeful to seek the names of family and long-lost friends. Down in the Crypt, warrior father and son stand back to back in bronze. The Sanctuary is lined by columns of black marble mined at Buchan in eastern Victoria. Friezes above them depict scenes of battle from the First World War. The centenary has been reached, and inevitably – some say – the public interest in ANZAC Day will decline. Attendances will be down next year, they warn. A television series screened this week rated poorly. But the old warriors are being replaced by young warriors – women as well as men. Children walk hand in hand not with their grandfathers, but their fathers. Si vis pacem para bellum: those who wish for peace must be ready for war. At the end of every conflict we swear ‘never again’. But until that vow is fulfilled, the Shrine will serve as a reminder that freedom is bought with sacrifice. « If I’m not around for a while, don’t be alarmed. Wonderful. Thank you. I take my kids to the Melbourne War memorial annually. Not always on Anzac Day though. Recently we visited Canberra, and I was in awe of the National memorial there too. I haven’t been to the war memorial in Canberra since I was at school. I have to get over there again. Its beautiful, especially the new WW1 collection. I have plenty of images from Canberra to post eventually. Working on two commemorative posts for today. I’ll be looking for them. Outstanding post!!! Gregory – I think you’ve outdone yourself in this one!! Thanks, but the photographers deserve some credit too! Our mate Deano was the source of several photos, including the wall with the inscription. I follow Deano as well, thanks for the heads-up! You still did a great job. Tried to leave this yesterday morning, but just discovered it didn’t quite work out. A wonderful post all the way around. The pictures are beautiful and the words that accompany them are as well. Has there ever been any trouble with keeping the view of the Shrine unobstructed as the city grew around it? There was an updating of the council regulations about ten years ago, and the height limits on buildings around the Shrine were omitted by accident. This opened the way to a proposal for a tower on St Kilda Road that would have cast a shadow across it. Fortunately the state government and local council got their act together and put the regulations back in place.